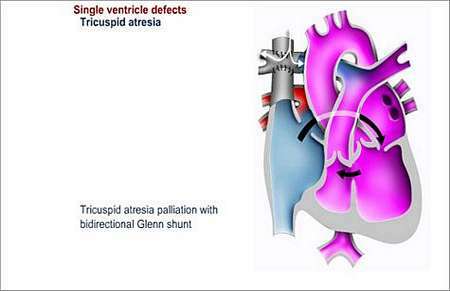 Tricuspid atresia is characterised by the absence of a tricuspid valve and usually a small right ventricle (right lower heart chamber). With tricuspid atresia (no opening), the valve between the right atrium (upper right heart chamber) and the right ventricle (lower right heart chamber) is missing and there is diminished blood-flow from the right ventricle to the lungs. 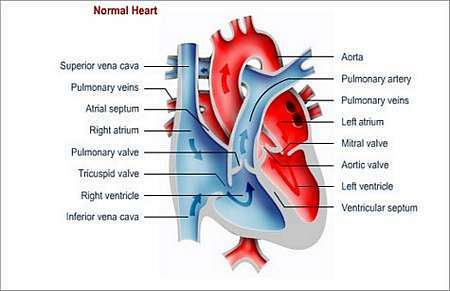 Under normal conditions, the tricuspid valve allows blood to pass from the right atrium to the right ventricle. The blood is then pumped to the lungs where it receives oxygen. It then flows back to the left upper heart chamber (left atrium), followed by flow to the left ventricle (lower left chamber). 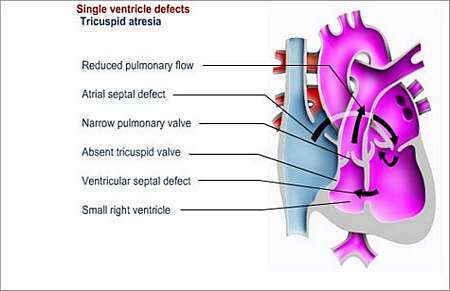 With tricuspid atresia, blood cannot reach the lungs and the left side of the heart, unless other defects such as atrial septal defect (ASD) , ventricular septal defect (VSD), or patent ductus arteriosus (PDA) are also present. Blood-flow to the lungs is possible through the defect that connects the two routes. This results in the mixing of oxygen-poor and oxygen-rich blood at atrial level. The mixed blood is then pumped to the lungs and the rest of the body, which causes the patient to appear cyanotic (blue discoloration of extremities such as the toes, fingers and lips). Different types of tricuspid atresia exist depending on whether blood-flow to the lungs is obstructed or not. The patient appears cyanotic. There is a blue discoloration of extremities of especially the fingers, toes and lips resulting from unoxygenated blood that is pumped into the systemic circulation to the various parts of the body. If more surgery is being considered, the patient may need a transesophageal echocardiogram (TOE) and/or a cardiac catheterisation. A shunt is placed between the superior vena cava (vein that carries deoxygenated blood from the upper body to the heart) and right pulmonary artery. This operation requires the use of a heart-lung machine. 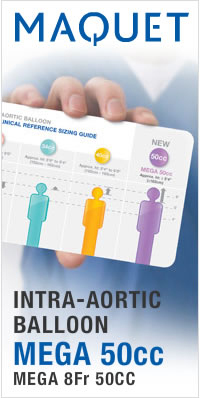 Involves bypassing the right ventricle by joining the right atrium to the pulmonary artery. This operation joins the superior and inferior vena cava (vein that carries blood from lower body back to the heart). It is very important that the patient follow-up with the heart specialist on a regular basis, as no operation corrects the condition completely. Alternatively, patients can visit outpatients for follow-up annually. The patient will have to take measures to prevent endocarditis for the rest of his or her life. 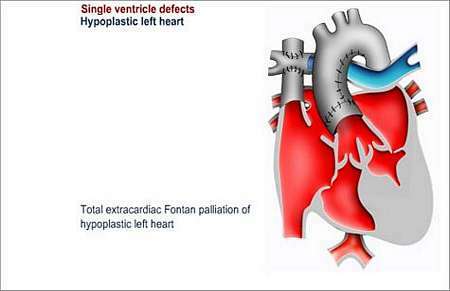 Endocarditis is an infection of the lining of the heart or heart valves. The patient should wear a Medic Alert card/bracelet stating the need for antibiotics before certain forms of surgery or dentistry.